Three screens of Elder are an attractive tool for the Forex technical analysis, which uses the same name strategy developed by a well-known trader. This method of trading involves the parallel analysis of the currency pairs on three different time frames, so the user receives a notification to enter the market. This tool of the technical analysis can work on 6-10 currency pairs simultaneously, depending on the program version, and displays MACD, EMA, and Stochastic indicators in the form of colored rectangles on the price chart. You can download the latest version of the trading robot on the MTDownloads website. On the picture below, you can see what the Elder indicator looks like, working in a trading terminal. The program under consideration is a part of the "Three Elder Screens" trading system, which is incredibly popular among traders around the world. It's easy and versatile so that even beginners can use the technique. Although, probably nobody can follow all the signals immediately, especially if the work is done on short time frames. Therefore, it's recommended to test an individual indicator first, and only after that, start the complex actions. Recall that the versions differ only by the number of tools which a trader can simultaneously work with it. For example, the "Three Elder Screens v 4.0" indicator allows you to use ten currency pairs at once. It is too much for a beginner. However, installing the latest version, you'll be ready to learn fast and gain the trade power rapidly, with no disturbance of a new software installing. The huge advantage of such an indicator is that it gives real signals to the user, in the form of the desktop screen notifications and e-mails. It's even better than getting accurate data on the nearest spread when you need to monitor the indications of a technical instrument. Here you get a complete signal for opening an order! The signal comes with a sound alert, so it's difficult to miss. Also, you can choose the option of the SMS notification in the program settings. As a result, the mobile version of the trading terminal makes it possible to open a profitable order and make a profit, being everywhere. It is, literally, a revolutionary method of trading on the foreign exchange market. Setting up the Elder indicator is also not more complicated than other trading robots. Setting the Elder indicator on any time frame, you will see an information window with colored rectangles - this is the most important part of the tool. The top part shows currency pairs traded; you can build them in any order that you want, using the settings. 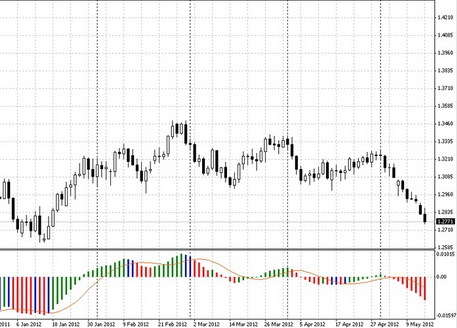 On the left, the auxiliary indicators are displayed in the column (MACD, EMA and Stochastic Oscillator). Each of these trading robots can be adjusted individually. Yellow or blue rectangle, depending on the program version - there is no trend. A signal for the order opening will be given when all the indicators are painted the same color, in front of the currency pair. You should buy when the pair will highlight in green, and sell – when it's red. It should be noted, that the program displays the Stochastic oscillator of two types (this trading robot shows the indications in the middle window). STOCH1 changes color when the blue line is rising above the 80 mark or falling below 20 and STOCH2 reacts to the intersection of the Stochastic lines in the oversold or overbought area. Levels of 20 and 80 of the second indicator are chosen by traders to reduce the false signals. If you like scalping, then your option is H4, H1, M15. It's quiet necessary to adjust the price range in minutes, for example, H1 equals 60 minutes, D1 is 1440. The strategy of "Three Elder Screens" is prevalent. First, it's easy to use, and it also has a low-risk level. The methodology can be used both independently or in addition to your strategy. Anyway, it will be a good way to simplify your trading on the currency exchange and make it as profitable as possible. Download the Elder indicator for free on the MTDownloads website.